Put down the chocolate and let these bites satisfy your sweet tooth! I’m definitely guilty of indulging in some tasty treats (whoopsie) every once in awhile, but they don’t always leave me feeling leanmazing. I believe however, it’s important to not feel deprived and still be able to enjoy all the foods you love, but in a healthier, leaner and more sustainable way. So for anyone who has a sweet tooth out there you’ll definitely want to try this recipe. These No Bake Energy Bites are the perfect treat to satisfy your sweet tooth without sending your body on a blood sugar roller coaster. Packed full of protein, fiber and healthy fats they’ll keep you satiated and give you an extra little boost of energy. The star ingredient is the medjool dates, which give the bites a creamy texture and plenty of sweetness, so no added sugar is necessary. Dates also contain loads of potassium (even more than bananas), which is essential for your heart and muscles and plenty of fiber, which will help keep you going throughout the day. 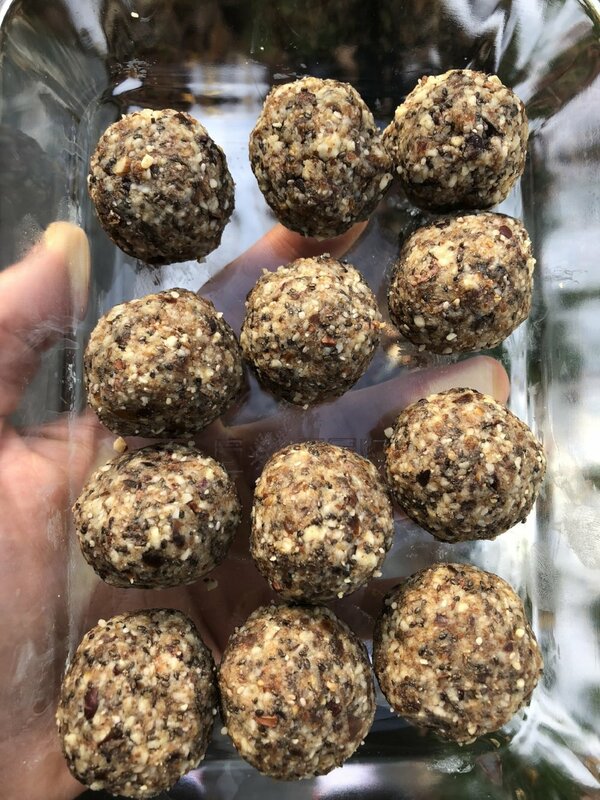 The energy bites are super simple to make, no baking is required and they are great for a lean prep. To make them you simply put all the ingredients in a food processor, form the balls with your hands and they’re done! They are the perfect solution to the afternoon slump if you’re tempted to indulge in some not-so-lean treats or post dinner if you’re looking for a sweet fix. Energy bites look good, but how ‘bout my slides?? Place the almonds, walnuts and chia seeds in a food processor. Blend for 1 minute, until the flour forms and the nuts have crumbled. Then add the remaining ingredients, pitting the dates before adding them. Blend for another minute until thick dough forms.